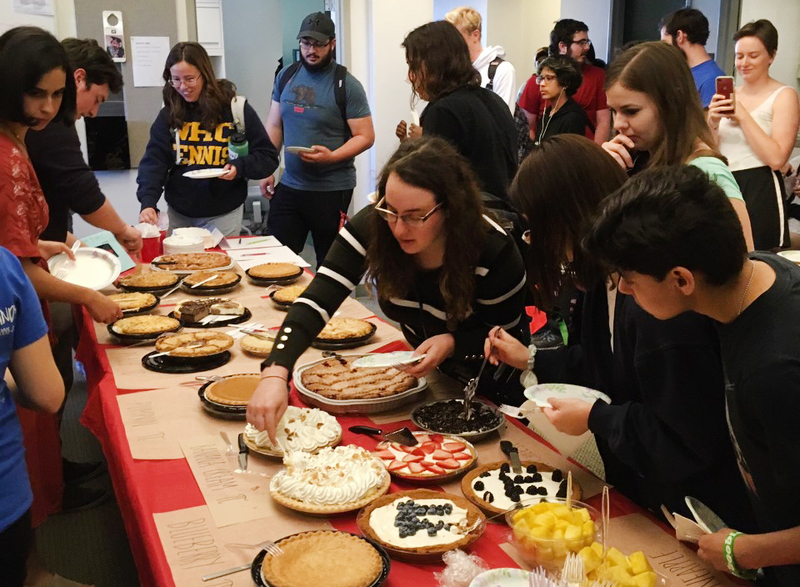 U of R’s Mathematics Department celebrates Pi Day with a variety of activities—and pies. Every year on March 14 (3.14), the University of Redlands Mathematics Department celebrates Pi Day at 1:59 p.m. (3.14159). This year we had a huge turn out from across campus. We ate 22 pies and three bowls of Pi-neapple, gave out the Pi Award, and had math-inspired competitions. 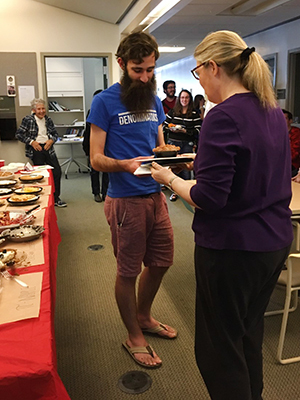 Professor Janet Beery presents Maxwell Auerbach ’21 with the Allen R. Killpatrick Pi Award. The Allen R. Killpatrick Pi Award was presented to Maxwell (Max) Auerbach ’21. This award, established in 2008 by Allen Killpatrick, a long-serving U of R math professor, and his family, recognizes an outstanding sophomore mathematics student who shows P=promise and I=interest in mathematics. Max has been a top student as a sophomore in junior-level courses, as well as an outstanding Appleton Hall community member, forming a tabletop gaming club and helping others with math tutoring. In mathematics, QED marks the end of a proof and comes from the Latin phrase "quod erat demonstrandum" meaning "what was to be shown" or "thus it has been demonstrated." This Pi-ku perfectly encapsulates the life of many mathematicians and math students who most often find themselves thinking they have a problem right, “Q.E.D.,” finding out it is wrong, “nope,” and then never giving up, “try again, girl”! Professor Larry Gross, who holds the San Manuel Band of Mission Indians Endowed Chair of Native American Studies, Race, and Ethnic Studies at the U of R, even taught us how to say “blueberry pie” in Ojibwe: “miini-baashkiminasigani-biitoosijigani-bakwezhigan.” Translation: blueberry sauce between flat bread [i.e. pie crust]. He also provided us with a pronunciation. Finally, every year on Pi Day we induct new members into the Mathematics Honors Society, Pi Mu Epsilon. Inductees are students from across campus who are working toward a major or minor in mathematics, have done outstanding work in their mathematics classes, and are committed to promoting scholarship and mathematics. This year, eight seniors will be wearing their violet, gold, and lavender graduation cords at the College of Arts and Sciences commencement ceremony. Learn more about studying mathematics at the University of Redlands.